Acadian Genealogy Homepage; Acadian Family Names! The following list consists of the names of all families, including those of couples who left no surviving descendants, who resided in continental Acadia between 1700 and 1755. These are all the families known to us who were (or, who might have been) among the approximately 13,000 Acadians involved in the Dispersion, whether deported or displaced in that tragic occurrence. Such a list cannot but be incomplete, due to the loss during Dispersion or subsequently of a substantial number of the documentary sources that would normally identify the individuals who made up the Acadian population throughout the half century. Particularly significant is the absence of census records for Acadia after 1714. Researchers have been able to reconstruct parts of the population of the colony through consultation of surviving parish records, but recourse to a wide variety of other sources has been, and as research goes on , continues to be necessary, to fill-in gaps in our knowledge. Such families, especially those who only settled in Acadia in the last quarter century before the disaster of 1755, are only identified as Acadians by documents concerning the exiles in Québec, France, the British American colonies, the West Indies, French Guyana or Louisiana. Many of these documents are just now coming to light, due to the assiduous searching of certain descendants determined to trace their Acadian connections. In some cases it is nonetheless still quite difficult to determine whether the family name actually would have been known in Acadia, or whether it only was added to the roster of Acadians during the long years of wandering in exile. It must be noted that this list (found in the section "Those Who Disappeared" below), includes the names of only those families who were part of the civilian population of Acadia, those of the families of the military who left long before the Depression in 1710 having been intentionally. 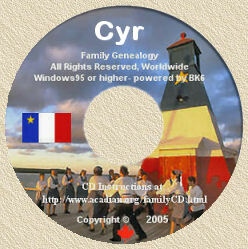 Click here for List of Acadian Surnames on the Acadian-Cajun Genealogy CD-ROM's available from me. The origin of our Acadian families, especially the oldest and largest among them, are but little known. For the entire period for which Acadia was colonized, only two passenger lists dating from 1636 and 1641, and one church register covering the years 1679 to 1686, are available to us. Our censuses, beginning in 1671, permit us to reconstruct the first three or four generations of each of our principal families, but they provide no information, contrary to the censuses of Plaisance and some later enumeration, for example, regarding origins, except in very exceptional instances. For genealogical purposes the absence for the early period of the records of marriages, or marriage contracts which normally form the most reliable sources of such information, is the chief difficulty one encounters. The marriages recorded at Port-Royal from 1702, at Grand-Pré from 1707, and Beaubassin from 1712, provide us with some samples of what we would find if all the registers had survived. Unfortunately, none of these three parishes just named, had all of its records and no registers survived at all for Cobeguit, the two churches at Pisiquit, the Rivière-aux-Canards, Chipoudy, the Pointe-de-Beauséjour, Tintamarre, Chebogue, or any of the lesser missions of old Acadia. Of course most Acadian families are of French origin. Even in the case of those for no precise origin is known, proof of this is given in many instances, by the Déclarations of the Acadians settled on Belle-Ile-en-Mer, wherein a substantial number of the first ancestors to live in Acadia, are uniformly described as "having come from France" (for example, Babin, Blanchard, Daigre, Dupuis, Terriot). Nevertheless, the exceptions to this rule are perhaps more interesting than those conforming to the norm. Among these exceptional families of Basque origin (Arosteguy, Bastarache, Ozelet) as well as one that is Spanish (Gousman) and two that are Portuguese (Mirande, Rodrigue). There are also several Irish families (Caissy/Casey, Guénard/Gainer, Long, Onel/O'Neale), three English (Druce, Granger, Hensaule/Henshaw), one Scottish (Jeanson/Johnson), one Flemish (Pitre), one from the Channel Islands (Semer), and even one from Croatia (Mathieu). It is also interesting to note that at least two families that may not seem to be French (Egan, Melanson) are nonetheless, of proven French origin! A number of names on the list would be immediately recognized as Acadian names everywhere Acadians have settled. These included the names of the families with the most numerous descendants such as the LeBlanc's, the Landry's, the Hebert's, the Boudrot's and the Richard's. These families are of course quite important on a statistical basis. There also appear on the list, the names of a number of families whose members played extraordinary roles in Acadian history. Besides the families of the hereditary nobility, or the seigneurial class (d'Abbadie de Saint-Castin, D'Amours, Denys, Le Borgne de Bélisle, LeNeuf de La Vallière, Mius d'Entremont and Turgis de Saint-Étienne de la Tour), who bring a certain amount of blue, even royal blood into the veins of some Acadians, there are families of the corsairs (Guyon, Maisonnat, Morpain), those of the heroes of the resistance against the British (Broussard, Maillet), as well as those of several victims of the French Revolution (Granger, Le Prince). Even the casual observer will notice that a substantial number of these Acadian families bore one or more nicknames. Some among these suggest that probable origins of the families, such as Amirault dit Tourangeau, Cellier dit Normand, Deveau dit Dauphiné, Duon dit Lyonnais, Guillot dit Langevin, Le Jeune dit Briard, Levron dit Nantois, Orillon dit Champagne, Préjean dit Le Breton and so on. These nicknames provide only clues to the origins of some families where such origins cannot otherwise be documented, but conversely, narrow-down the field of possible origins of the original seventeenth century recruits, since such nicknames would make little sense unless referring to something distinctive about these families. Other nicknames betray the military past of the family's founder. For a substantial period during which no official efforts were made to attract new colonists, most of the new settlers in Acadia were former soldiers whose years of service were sufficient to permit their retirement and marriage to local girls. In the case of Berrier dit Machefer, Bonnevie dit Beaumont, Creysac dit Toulouse, Garceau dit Tranchemontagne, La Lande dit Bonappetit, Léger dit La Rozette, Marchand dit Poitiers and a few others, documentary evidence of military service exists. In the case of several others, including LeBert dit Jolycoeur, Lord dit La Montagne, Mazerolle dit Saint-Louis and Richard dit Sansoucy, the sort of nickname borne by the family bespeaks a military background, even in the absence of proof. A relatively uncommon Christian name might also be perpetuated as a replacement for the original family name. Thus the Brasseurs were called Mathieu; the Caissys, Roger; the Henrys, Robert; and the Vigreaus, Maurice, from the given name of the first ancestor of each line. In other cases, a branch of a large family might adopt the first name of the founder of the branch in place of the family name, to distinguish itself from other branches of the same clan (Hébert dit Manuel, Pitre dit Marc, Vincent dit Clément), or the descendants of one family might employ their ancestor's given name in the same way, to set themselves apart from another family with the same last name (Martin dit Barnabé). As posted on Facebook, July 2011, by Ribin Heider: The "Dit name" in North America has it's roots in the military tradition of the French army of regimental anonymity. French recruits were given their official "Dit name" upon acceptance into a regimental group. For the period of enlistment, they were known almost exclusively by these names. Their pay, orders and administration were all issued via these names. One purpose of the names was to separate the recruit from his civilian past and create of the military, his family and sole society. The names did not vary from regiment to regiment very much, the net result being that Lafontaine and Martel families as well as Lajeunesse and Esprit families do not not necessarily share any familial relationship outside the military. As the regiments disbanded in North America, they were often enticed to stay and put down roots. Land grants to these ex-marines and infantry men, were granted under the direction of the war office and so, were granted in military fashion to Paul Richard Dit Martel . Thus these 'nom de guerres' became legal name in the civil law of New France. As soldiers would be disbanded in groups and civil defense (militia) groups were formed, this tradition would be reinforced in the social fabrique of the towns and villages and seigneurial organization of the colonies. Name sake sons, often felt the need to assert separate identities from their father's military ones and so would adopt nicknames or were given them, so that differentiation would be easier. Le Breton, St Seine, and St Pierre are all examples of names of differentiation that were affixed to common names, to separate non-related family groups who hailed from different regions. Le Gros, Lejeune , Le Petit, Le Grand were used to separate namesakes within families. As many of you have noted it took nearly a hundred years of settlement before the colonist began using names other-than the small groups of accepted Sts names. Click Here for more information on "Dit" Names. Some nicknames reflect the ancestor's occupation. Thus the descendants of the blacksmith Thomas Sauvage, came to be known as the Forgeron family, while those of the butcher André Simon, called themselves Bouchers. In other cases, the nickname was most likely suggested by the ancestor's occupation, but documentary evidence of the latter is lacking (Calvé and Guérin, both dit Laforge). Over all, the list includes the names of families whose members occupied a wide spectrum of social and economic levels, from the upholders of justice (Boudrot, Desgoutins) down to those who appear to have come here to evade its execution (Denis, Mangeant dit Saint-Germain, Sauvage dit Forgeron, Serreau de Saint-Aubin). Certain families survived and even flourished in the new Acadia into which they were eventually transplanted, but their names came to be found only in those areas, and may consequently appear to be somewhat alien to Acadians from other regions. Among the names that persist only among the Cajuns in Louisiana, are Arcement, Gravois, Heusé/Usé, Hugon, Mouton and Naquin. Only in Québec does one find Fontaine, Garceau, Gourdeau, Grandmaison, Héon, Long, Lord, Lucas, Messaguay, Poitevin, Rousse and Saindon. The Cloistre, Orillon dit Champagne and Part families, carry on in both Louisiana and Québec, but not in Acadia. Marcadet and Pugnant dit Destouches persisted in Saint-Pierre and Miquelon until the Napoleonic Wars. Even in Acadia itself, certain families re-established themselves only in certain areas. The Bugeauds were thus only to be found on Chaleurs Bay. The Bastarache dit Basque family survived only in New Brunswick and northern Nova Scotia. The Bruns were almost exclusively in southern New Brunswick and northern Nova Scotia. The Caissys and the Guéguens became distinctly New Brunswick Acadians too, although a few spread from there into other provinces. Many Acadians from New Brunswick think of Boutin, Forgeron, Marchand, Martel and Samson, as French-Canadian names and the Acadians of the first, fourth and fifth families just named, can indeed trace their ancestry back to Québec, but these are also the names of important Acadian families in southern Cape Breton. Amirault (Mius) d'Entremont and Moulaison, are concentrated in western Nova Scotia. Corporon, DeCoste (formerly Coste), Poitier (or Pothier) and Trahan, are also names that could only be found in Nova Scotia (immediately) after the Dispersion. Although there appears to be few Potier/Pothier's now living in Louisiana, many Trahan's now reside there (including by friends, Ray Trahan and his wife Brenda Comeaux-Trahan, Director of the Acadian Memorial Museum in St. Martinville, Louisiana). Similarly, mention of Bernard, Buote, or Longuépée families in a genealogy, necessarily means that the Acadians of Prince Edward Island, must be involved in the lineage. The list of Acadian family names, provide the careful reader with some interesting and valuable insights into Acadian history. The small tragedies of normal human existence and the over-overwhelming tragedies of the Acadian Diaspora, have left their marks on this list, to the extent that any present-day Acadian, from any area, will find but few familiar names here; the others were scattered to far-off destinations, or destroyed altogether, through the dangers and hardships of the great trauma inflicted on our people. In a way, the following list stands as a tribute and a monument to them. For after two centuries, we still strive to preserve the memory of those who suffered the loss of their property, their country and even their lives... because of their loyalty to their ideals and faith. The above-noted was written by Stephen White for Parks Canada and permission to reproduce provided me by Stephen, as well as Portage Technologies Inc., producers of "The Acadia CD-ROM". I am also grateful to Parks Canada for allowing reproduction. The "Dit name" & "Nom de Guerre" in North America has it's roots in the military tradition of the French army of regimental anonymity. French recruits were given their official "Dit name" upon acceptance into a regimental group. For the period of enlistment, they were known almost exclusively by these names. Their pay, orders and administration were all issued via these names. One purpose of the names was to separate the recruit from his civilian past and create of the military, his family and sole society. The names did not vary from regiment to regiment very much, the net result being that Lafontaine and Martel families as well as Lajeunesse and Esprit families do not not necessarily share any familial relationship outside the military. As the regiments disbanded in North America, they were often enticed to stay and put down roots. Land grants to these ex-marines and infantry men, were granted under the direction of the war office and so, were granted in military fashion to Paul Richard Dit Martel . Thus these 'nom de guerres' became legal name in the civil law of New France. As soldiers would be disbanded in groups and civil defense (militia) groups were formed, this tradition would be reinforced in the social fabrique of the towns and villages and seigneurial organization of the colonies. Name sake sons, often felt the need to assert separate identities from their father's military ones and so would adopt nicknames or were given them, so that differentiation would be easier. Le Breton, St Seine, and St Pierre are all examples of names of differentiation that were affixed to common names, to separate non-related family groups who hailed from different regions. Le Gros, Lejeune, Le Petit, Le Grand, were used to separate namesakes within families. As many of you have noted it took nearly a hundred years of settlement before the colonist began using names other-than the small groups of accepted Sts names. The inhabitants of the Saint Lawrence Valley in the 17th and 18th centuries were subject to the laws and customs of France. Each of them had a family name and a given name. Children had the family name of their father. Married women kept their family name from birth, on official documents, although they were commonly known by their husbands family name. For instance, after Jeanne Marie-Louise Gagné married Guillaume-François Baret, she was listed as Jeanne Gagné on the baptismal certificates of her children, but was known as Madame Baret to her neighbors. Though the practice of handing on family names from one generation to the next is helpful for genealogists, there are some problems. First, there are many variations for some names, for several reasons. Most colonists in early Québec were unable to read and write, or even of signing their names. Even for the literate, spelling was not standardized. Priests and notaries, charged with recording vital statistics, wrote the names as they heard them. For instance, Guillaume Barets family name might also be written Barette or Barrette, and Jeanne Gagnés family name might be also be written Gagnier or Gasnier. Another factor for those who decipher colonial documents is that the data can be difficult to read because some letters such as m, n, r, and u are easily confused in handwriting. And, of course, there are the inevitable transcription errors made by the person who entered the data. For instance, a priest who served in the same parish for two or three decades might write the family name of the brides grandmother instead of that of her mother in the marriage register, or the name of another brother of the babys father instead of the name of the actual godfather. Another problem concerns the use of dit names, so called because they are introduced by the French word dit (called). Dit names have many origins. Many were originally the nom de guerre adopted by the troops in a specific military company. The name Lafleur is the most common of the noms de guerre, associated with about 220 family names. There are nicknames associated with a physical characteristic, as Legrand or with a place of origin, as Normand, or the location of a property, as Lapointe. In some cases, the mothers family name is associated with the fathers, as Jacques Couillard dit Després. As for our exemplar couple, the husband has a dit name: Guillaume-François Baret dit Courville, while his spouse is known simply as Jeanne Marie-Louise Gagné. Their granddaughter Marie-Josephe, spouse of Pierre-Amable Baret dit Courville is known sometimes as Marie-Josephe Gagné, sometimes as Marie-Josephe Catin. But that, as they say, is another story! The list is presented in three parallel columns. The column on the left (first column) contains an alphabetical list of Quebec surnames (family names), as found in sources such as baptismal and marriage registers and in repertories such as Jette, PRDH and Laforest. The center column (second column) contains spelling variations of the name in the first column, and only of that name. The column on the right (third column) contains "dit" names for the name on the left, and only for that name. Spelling variations and "dit" names for the names on the right will be found where each of these names appears in the column on the left (first column). If a particular family name does not have any spelling variations nor any dit names, that will be noted in the respective columns. Click here to see how many times the surnames you are researching, appear on the Acadian-Cajun Genealogy CD-ROM's available from me.